Yorkville is a neighbourhood and former village in Toronto, Ontario, Canada. It is roughly bounded by Bloor Street to the south, Davenport Road to the north, Yonge Street to the east and Avenue Road to the west, and is considered part of "The Annex" neighbourhood officially. 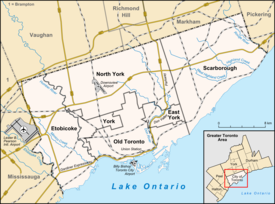 Established as a separate village in 1830, it was annexed into Toronto in 1883. Yorkville is diverse, comprising residential areas, office space, and an array of shopping options. Within the Yorkville district is one of Canada's most exclusive shopping districts, anchored by the Mink Mile along Bloor Street. In 2006, Mink Mile was the 22nd most expensive street in the world, with rents of $208 per square foot. Yorkville had rents of $300 per square foot in 2008, making it the third most expensive retail space in North America. In 2008, the Mink Mile was named the seventh most expensive shopping street in the world by Fortune Magazine, claiming tenants can pull in $1,500 to $4,500 per square foot in sales. Founded in 1830 by entrepreneur Joseph Bloore (after whom Bloor Street, one of Toronto's main thoroughfares, is named) and William Botsford Jarvis of Rosedale, Toronto, the Village of Yorkville began as a residential suburb. Bloore operated a brewery north-east of today's Bloor and Church Street intersection. Jarvis was Sheriff of the Home District. The two purchased land in the Yorkville district, subdividing it into smaller lots on new side streets to those interested in living in the cleaner air outside of York. The political centre of Yorkville was the Red Lion Hotel, an inn that was regularly used as the polling place for elections. It is here that William Lyon Mackenzie was voted back into the Legislature for 1832 and a huge procession took him down Yonge Street. The village grew enough to be connected by an omnibus service in 1849 to Toronto. By 1853, the population of the village had reached 1,000, the figure needed to incorporate as a village and the Village of Yorkville was incorporated. Development increased and by the 1870s, Potter's Field, a cemetery stretching east of Yonge Street along the north side of Concession Road (today's Bloor Street) was closed, and the remains moved to the Necropolis and Mount Pleasant cemetery. By the 1880s, the cost of delivering services to the large population of Yorkville was beyond the Village's ability. It petitioned the Toronto government to be annexed. Annexation came on February 1, 1883, and Yorkville's name changed officially from "Village of Yorkville" to "St. Paul's Ward" and the former "Yorkville Town Hall" became "St. Paul's Hall". The character of the suburb did not change and its Victorian styled homes, quiet residential streets, and picturesque gardens survived into the 20th century. In 1923, Toronto Hebrew Maternity and Convalescent Hospital was opened at 100 Yorkville Avenue and a year later the name was changed to Mount Sinai Hospital. The facade of this building still stands today and housed retailer Chanel. Row of shops south of Yonge Street and Yorkville Avenue, 1975. During the 1960s and 1970s, the area became the city's Bohemian cultural centre. After the construction of the Bloor-Danforth subway, the value of land nearby increased as higher densities were allowed by the City's official plan. Along Bloor Street, office towers, the Bay department store and the Holt Renfrew department store displaced the local retail. As real estate values increased, the residential homes north of Bloor along Yorkville were converted into high-end retail, including many art galleries, fashion boutiques and antique stores, and popular bars, cafes and eateries along Cumberland Street and Yorkville Avenue. Many smaller buildings were demolished and office and hotels built in the 1970s, with high-priced condominium developments being built in subsequent decades. Along Bloor Street is located the "Mink Mile" shopping district. The street is lined on both sides of the street with office buildings with retail stores in the bottom one or two floors. The main streets of Avenue Road and Bay Street north of Bloor are similarly developed. North of Bloor, on Yorkville and Cumberland streets, between the main arteries, the character changes to smaller buildings containing art galleries, first-floor retail and restaurants. Further north still are single-family detached and semi-detached homes dating to the 19th century. Yorkville is home to a number of upscale boutique stores. Yorkville has upscale shopping, restaurants, and the first five star hotel in Canada. Upscale boutiques include Burberry, Prada, Gucci, MAC Cosmetics, Hugo Boss, Chanel, Hermès, Louis Vuitton, Holt Renfrew, Tiffany & Co., Escada, Ermenegildo Zegna, Cartier, Harry Rosen, Calvin Klein, Cole Haan, Vera Wang, Lacoste, Ferrari, Maserati, Williams-Sonoma, Bang and Olufsen, Betsey Johnson, Max Mara, Montblanc, Bulgari, Birks, Coach, Guerlain, Swarovski, and others. The Holt Renfrew store on Bloor is the luxury retailer's flagship and largest store with four floors and boutiques. Many flagships of other companies are located here as well, such as Harry Rosen, Town Shoes, Lacoste, Gucci, Coach, and Chanel (in which the Canadian flagship became one of the largest in the world.) Browns Shoes opened on Bloor, with merchandise that is much more expensive than at their other boutiques. There are many offices and professional services. Notable companies/organizations include the Retail Council of Canada, Canada Post, IBM Canada, Alliance Atlantis, Famous Players, Paramount Pictures, Showcase Television, Twentieth Century Fox Film Corporation, Unilever and the consulates of several nations. MTV Canada headquarters are located in Yorkville as well. Yorkville is home to some of Toronto's most expensive condominiums, most starting at over one million dollars and going well beyond, including: The Prince Arthur, Renaissance Plaza, 10 Bellair, One St. Thomas, Windsor Arms Hotel, The Hazelton Hotel & Residences, Hazelton Lanes. Canada's largest museum and the fifth largest in North America, the Royal Ontario Museum is located just to the west of Yorkville, at the intersection of Bloor and Avenue Rd. Toronto's largest public library, the Toronto Reference Library, is located on Yonge Street, north of Bloor. Yorkville has its own local public library on Yorkville Avenue. The Village of Yorkville Park is a series of unique gardens located on the south side of Cumberland Street stretching west from Bellair Street. It was designed by Oleson Worland Architects in association with Martha Schwartz / Ken Smith / David Meyer Landscape Architects to celebrate the surrounding neighbourhood and reflect the diversity of the Canadian landscape. At the east end, a paved square of land is dotted with Scots Pines growing out of circular benches. Further west, is a set of metal archways among a row of crabapple trees. Next, there is a marshy wetland. A silver-coloured metal structure houses a waterfall bordering one side of a courtyard filled with benches and chairs, while a 650-tonne hunk of billion-year-old granite, cut out of the Canadian Shield and transported to the park in pieces, is towards the west end. The westerly exit of Bay subway station arises next to the rock. The park has received the American Society of Landscape Architects Award 1997, the International Downtown's Association Award of Merit 1997 and the City of Toronto Urban Design Award of Excellence 1997. In 2012, the American Society of Landscape Architects reviewed the Village of Yorkville Park upon restoration and once again bestowed an award: the Award of Excellence in the Landmark category. Named for the local businessman and politician Frank Stollery (1879-1971), this small wedge shaped urban park runs west from Yonge Street between Davenport Road and Scollard Street. The theme of the park now celebrates the history of Davenport Road. Named for the Canadian politician Jesse Ketchum, this greenspace park has a playground and is located next to Jesse Ketchum Public School. Commemorating the site of the Yorkville Town Hall, this small urban oasis has paths and benches sheltered between rows of hedges, trees and oversized pots. The square abuts on the east side the Yorkville branch of the Toronto Public Library. Versailles Antiques and Fine Art Ltd.
^ Bonoguore, Tenille (2008-07-19). "The Downside of Up". The Globe and Mail. Retrieved 2009-03-16. ^ "The world's most expensive streets - Bloor Street, Toronto". Fortune. CNNMoney.com. 2008-08-26. Retrieved 2009-03-16. ^ a b Filey, Mike (February 1, 2009). "Yorkville - the first 'burb". Toronto Sun. Retrieved July 13, 2010. ^ Henderson, Stuart. "Making the Scene: Yorkville and Hip Toronto in the 1960s". Retrieved August 26, 2012. ^ "Joni Mitchell - Night in the City - Lyrics and Footnotes". ^ "Toronto: Bloor Yorkville: Designer Couture". Retrieved July 13, 2010. ^ "Canadian Landscaping Projects Recognized as Among World's Best". Construction Canada. Construction Specifications Canada. Archived from the original on 2013-02-21. Retrieved 2012-09-29. Toronto's recently restored Yorkville Park was the recipient of this year's Award of Excellence in the Landmark category. ^ Filey, Mike. "Frank Stollery". Mount Pleasant Cemetery: An Illustrated Guide. Archived from the original on March 7, 2016. Retrieved January 1, 2015. "Annex neighbourhood profile". City of Toronto. Retrieved 2009-03-16. "Making the Scene: Yorkville and Hip Toronto in the 1960s". University of Toronto Press. Retrieved 2011-05-25. Wikimedia Commons has media related to Bloor Yorkville.